His first listed production credit on IMDB is "Special Effects Assistant" on Ken Russell's Tommy, Chris Corbould has since then he has added 52 more credits with the most recent being "Special Effects Supervisor" on J.J. Abrams's Star Wars: Episode VII. In between he has worked with almost every major talent in the film industry, he has worked on almost every film worth mentioning and most definitely the ones we rate, we aren't the only ones who think so as he (and his team) have been nominated for many awards and he went home with an Oscar for Best Achievement in Visual Effects on Christopher Nolan's Inception. He has worked on 13 Bond films, overseeing the special effects from GoldenEye onwards, he has worked on the Superman series, The Dark Knight Trilogy, a Highlander film, Willow, Nightbreed, Alien3, Lara Croft, Shadowlands, John Carter, X-Men: First Class to give some depth to the breadth of Chris Corbould's work. He is very well known for pulling off impossible effects in camera, that is without the use of computer generated imagery. So you will understand if I was daunted going in to chat with man himself. 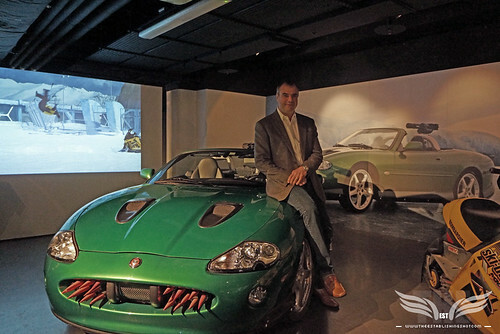 The Establishing Shot BOND IN MOTION - BOND SPECIAL EFFECTS SUPERVISOR CHRIS CORBOULD & JAGUAR XKR FROM DIE ANOTHER DAY @ LONDON FILM MUSEUM COVENT GARDEN, a photo by Craig Grobler on Flickr. I could talk and probe Corbould's mind for a whole day discussing just one of the films he has worked on, how on Earth was I going to fit a salient conversation, with one of my heroes into a couple of minutes, with the world's press breathing down my neck surrounded by legends from across the Bond films? As it turns out Chris Corbould epitomises that thing that people, in the know, talk about when they discuss why they want to work on quality productions - like the Bond films, that is past the gloss and glamour and why the relationships and friendships developed between crew are so tight - part of what makes the Bond legacy so enduring - Chris Corbould is very present whilst being easy to talk to, soft spoken and humble without a hint of the arrogance that comes to weaker people when success or personal recognition is attained. 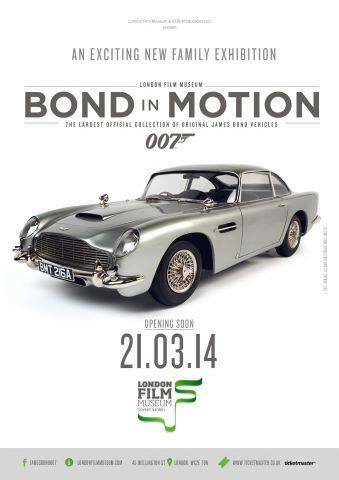 Our chat took place at the breathtaking Bond in Motion Exhibition at the London Film Museum and I could not have wished for a better location as Chris was able to point to relevant props and pieces whilst chatting and I have to say it is pretty mindblowing being in the middle of the Bond in Motion exhibition surrounded by film and Bond history within arms reach. This is how our chat went down. I'm blown away, how wonderful is this exhibition? Chris Corbould: It's lovely isn't it. 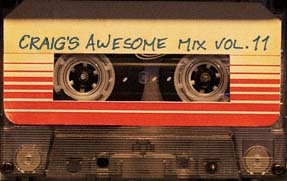 For me it's a great walk down memory lane. There are some bits in the collection that I remember working on when I was 17. There was a moment when I thought I did that weld 30 or 40 years ago. A real walk down memory lane. These guys deserve every success they have done a lot for the industry. Chris you have such a vast career and have worked with almost everyone in the industry at some point on any film that is worth mentioning - but can you choose one special effect from across your career that you are particularly proud of? 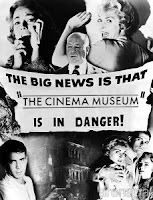 Chris Corbould: Ha, ha I have missed a few films. Wow! I don't know You know I'm proud of everything that my team, and I must emphasise the fact that it is a team and it's not just me. My team are incredible with great engineers, electricians and many others. There are so many great moments that tank chase in GoldenEye, stands out as it was my first James Bond film as overall supervisor and I was very instrumental in the tank chase. I have very fond memories of that. 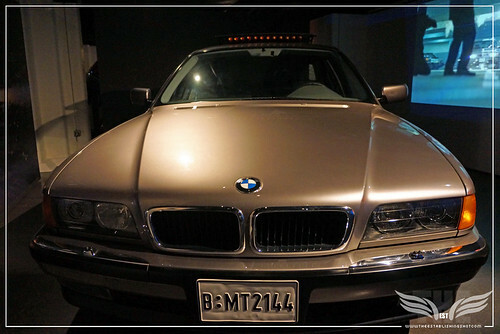 The Establishing Shot BOND IN MOTION - BMW 750 IL FROM TOMORROW NEVER DIES @ LONDON FILM MUSEUM COVENT GARDEN, a photo by Craig Grobler on Flickr. 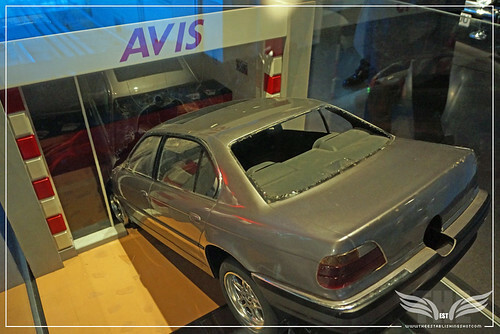 The Establishing Shot BOND IN MOTION - BMW 750 IL MODEL CRASH FROM TOMORROW NEVER DIES @ LONDON FILM MUSEUM COVENT GARDEN, a photo by Craig Grobler on Flickr. 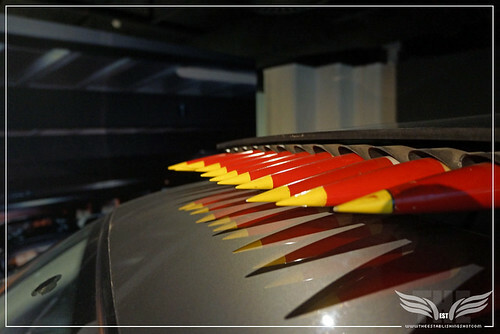 The Establishing Shot BOND IN MOTION - BMW 750 IL ROOF MISSILE DETAIL FROM TOMORROW NEVER DIES @ LONDON FILM MUSEUM COVENT GARDEN, a photo by Craig Grobler on Flickr. 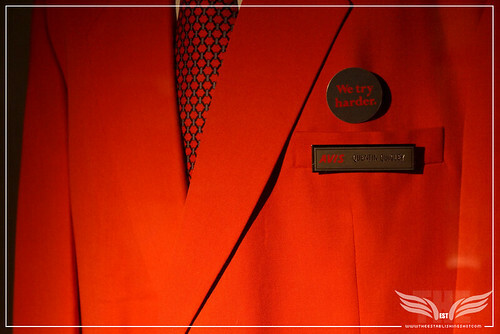 The Establishing Shot BOND IN MOTION - Q's UNDERCOVER AVIS JACKET FROM TOMORROW NEVER DIES @ LONDON FILM MUSEUM COVENT GARDEN, a photo by Craig Grobler on Flickr. From Tomorrow Never Dies the whole BMW 750 sequence I am very proud of. 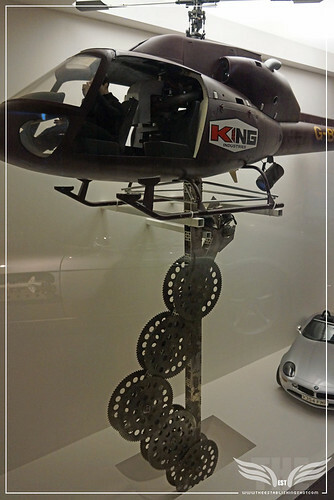 The Establishing Shot BOND IN MOTION - KING INDUSTRIES BUZZSAW HELICOPER MODEL FROM THE WORLD IS NOT ENOUGH @ LONDON FILM MUSEUM COVENT GARDEN, a photo by Craig Grobler on Flickr. 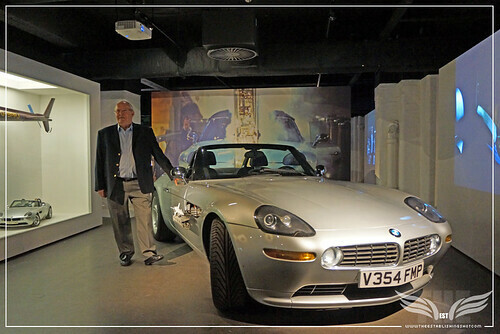 The Establishing Shot BOND IN MOTION - BOND PRODUCTION DESIGNER PETER LAMONT & BMW Z8 FROM THE WORLD IS NOT ENOUGH @ LONDON FILM MUSEUM COVENT GARDEN, a photo by Craig Grobler on Flickr. 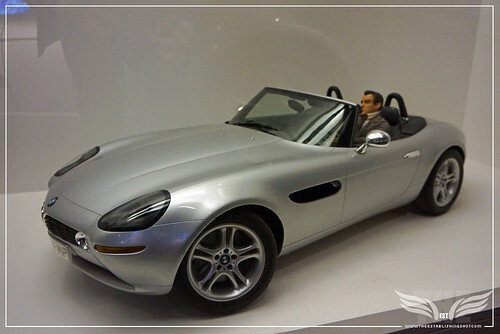 The Establishing Shot BOND IN MOTION - BMW Z8 MODEL FROM THE WORLD IS NOT ENOUGH @ LONDON FILM MUSEUM COVENT GARDEN, a photo by Craig Grobler on Flickr. 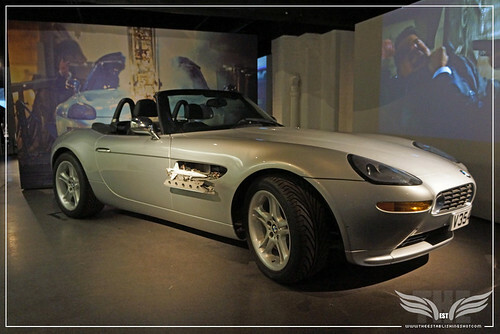 The Establishing Shot BOND IN MOTION - BMW Z8 FROM THE WORLD IS NOT ENOUGH @ LONDON FILM MUSEUM COVENT GARDEN, a photo by Craig Grobler on Flickr. 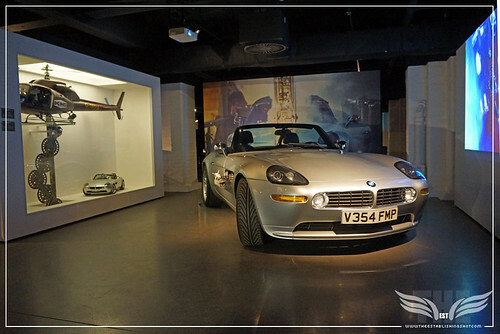 The Establishing Shot BOND IN MOTION - BMW Z8 FROM THE WORLD IS NOT ENOUGH @ LONDON FILM MUSEUM COVENT GARDEN (2), a photo by Craig Grobler on Flickr. 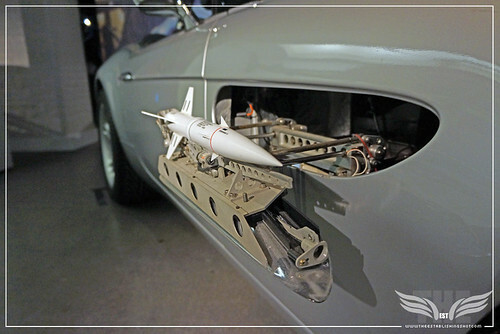 The Establishing Shot BOND IN MOTION - BMW Z8 FROM THE WORLD IS NOT ENOUGH SIDE AIR VENT MISSILE DETAIL @ LONDON FILM MUSEUM COVENT GARDEN, a photo by Craig Grobler on Flickr. From the The World Is Not Enough the helicopter with a saw blades right up to Skyfall and the underground train crashing through the ceiling. There are so many great moments. Someone are great moments because of the country they are in, others are spectacular one-offs that you've lost a lot of and then when it happens it all works well and you can sleep again. Talking about spectacular one-offs that you have lost sleep over, can you recall a particular special effect that was a real challenge? Chris Corbould: Well they are all challenges but something like the train crashing through the ceiling, we could have done it more than once but that would have meant a two or three week re-build of the set. It's always challenging blowing up the villains lair, similar to the Skyfall mansion. Those are one-offs you don't get two gos at that it's a pile of burning rubble at the end. They'll always a bit of a worry but we have to test and test and test and make sure we tested every single element and ensure that if one part doesn't go right that there are other elements to cover over it. I have learnt to deal with that as part of the job. Having started out when most effects were done in camera or with practical effects whereas these days CGI has proliferated almost every film. Can you tell us a little bit about how your approach to the planning and execution of effects may have changed over the course of your career? Chris Corbould: I'm passionate about my craft and try get onto films where the director has a fondness for doing practical effects on film, hence my relationship with Christopher Nolan he is a great advocate of doing things for real as are the Bond films. My relationship with Michael Wilson and Barbara Broccoli is that they have hired me many times and I would like to think it is because I bring something to the table as far as trying to do things for real. 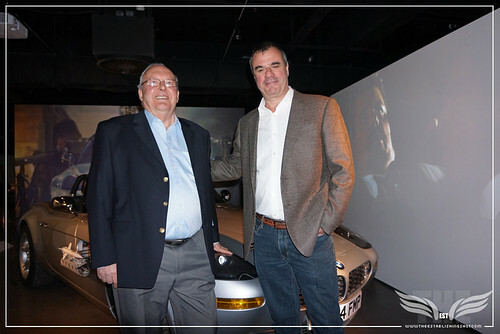 The Establishing Shot BOND IN MOTION - BOND PRODUCTION DESIGNER PETER LAMONT & SPECIAL EFFECTS SUPERVISOR CHRIS CORBOULD @ LONDON FILM MUSEUM COVENT GARDEN, a photo by Craig Grobler on Flickr. Can you tell us a little bit about the difference in style of directing between Sam Mendes and Christopher Nolan? Chris Corbould: Well they are both very, very clever individuals. Chris Nolan is a great filmmaker who I have a tremendous amount of respect for. Sam has a very theatrical background and I think that is the strength of Skyfall that it had a character driven part to it and it was not just a special effects stunt driven extravaganza. It was about the people, the characters in the film. What we did, just melded into them. 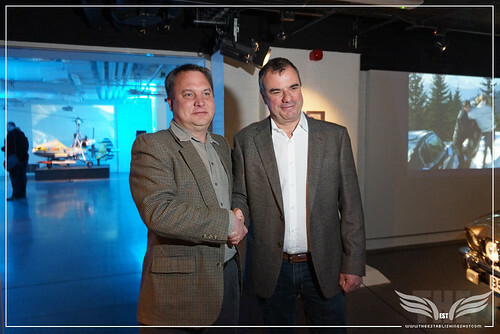 The Establishing Shot BOND IN MOTION - BOND ART DESIGNER SIMON LAMONT & SPECIAL EFFECTS SUPERVISOR CHRIS CORBOULD @ LONDON FILM MUSEUM COVENT GARDEN, a photo by Craig Grobler on Flickr. Are there any special effects that you haven't done yet? Or you you would like to redo? Chris Corbould: Oh! There are lots and lots. You know whenever I start a film and I go scouting for locations I sort of wander around thinking wouldn't it be great to blow that bridge up? Or for a car to go off there? Wherever we go in the world my mind is constantly working on how we can do things. I know it's very early days still Ben is wondering if you could tell us anything about what we can expect from Bond 24? Have you advanced to a stage where you know something and can't tell us or is there nothing to tell yet? 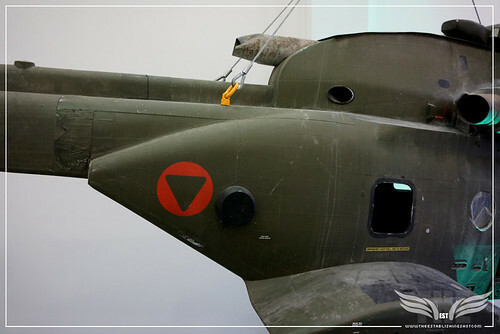 The Establishing Shot BOND IN MOTION - AUGUSTAWESTLAND AW101 HELICOPTER MODEL FROM SKYFALL @ LONDON FILM MUSEUM COVENT GARDEN, a photo by Craig Grobler on Flickr. The Establishing Shot BOND IN MOTION - AUGUSTAWESTLAND AW101 HELICOPTER EMBLEM DETAIL FROM SKYFALL @ LONDON FILM MUSEUM COVENT GARDEN, a photo by Craig Grobler on Flickr. 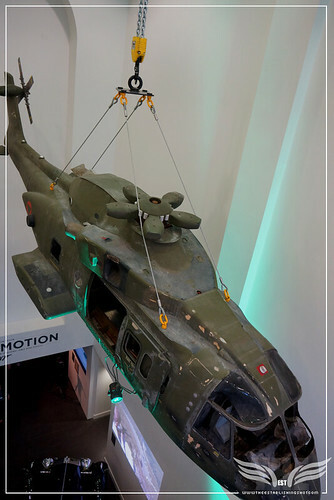 The Establishing Shot BOND IN MOTION - AUGUSTAWESTLAND AW101 HELICOPTER MODEL FROM SKYFALL @ LONDON FILM MUSEUM COVENT GARDEN (2), a photo by Craig Grobler on Flickr. Finally I was hoping you could shed some light on something that has been bugging me since seeing Skyfall, what does the upside down triangle in the orange circle emblem on the side of the AgustaWestland helicopter mean? Chris Corbould: Oh! which one? 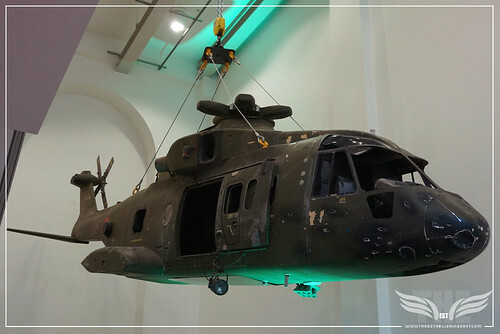 [we adjourn to the 1/3 scale model of AgustaWestland’s AW101 helicopter from Skyfall situated high above the entrance of the London Film Museum] Oh no that has no particular or secret meaning we were just trying to dress the helicopter as authentically as possible.